The Yodel brand is set to hit the streets in October when more than 400 Mercedes Sprinter vans in its new livery are introduced into the delivery network. The rebranding of the business, formed when Home Delivery Network took over DHL’s domestic parcels business, was announced March. Yodel reckons is it now the UK’s second-largest parcel delivery business. Jonathan Smith, chief executive officer of Yodel, said: “We are very excited to see the physical manifestation of our new brand now taking shape. The introduction of the new livery marks the start of a phased rollout across our networks with many more vans to follow next year. The vans will be operate from 12 depots in the south of England and Northern Ireland. Yodel has also bought several Mercedes ECO-Start models, with engines that stop when stationary for more than 2 seconds with clutch released in neutral. This supports Yodel’s environmental strategy of reducing overall fuel consumption. Vehicle graphics supplier AstSigns won the two year livery contract. 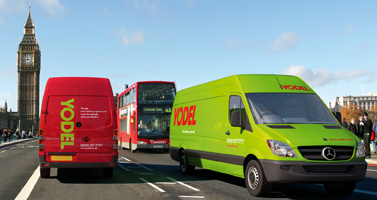 It is applying an vinyl vehicle wrap to the Yodel fleet, starting with 400 vans.